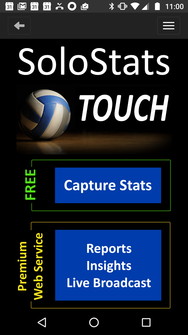 SoloStats TOUCH is a simple, free-form stat taking app that allows you pick the stats you want to track and simply tap the screen. 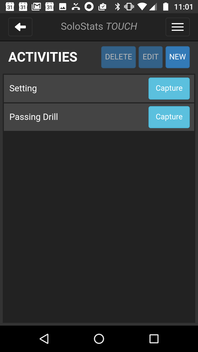 Track one to many players and select the simple set of stats you want to capture. If you shoot video, you can synchronize the stats through SoloStats VIDEO and see exactly the highlights you want to see. Share the video clips with your family and friends. Add your player. You can have more than one but it's easiest to track one player. 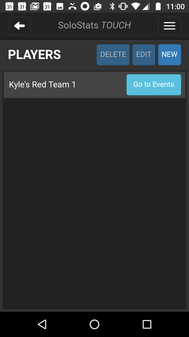 Create an Event - This could be a Match or Scrimmage. Create an Activity - This could be a Game. If you want more detail, it could be a type of touch - server, dig, attack, etc. Enter the name of the event. Typically, it's a Match so call it "vs Club Red 15-1", for example. 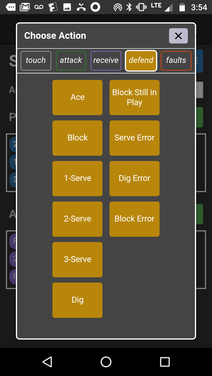 Because we only have one player, all you need to do is tap the action - for example, Tap Serve Touch when Sally serves. 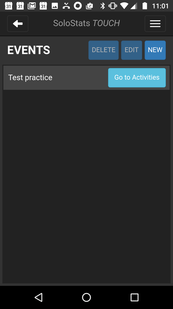 Add a Name for the Activity. This is a game so call it "Game 1". Then tap Select next to Players. Since there's only one player, tap her, then tap the close box. In this example, we will Select All of the General Touch buttons. Now you are ready to take stats. Tap Begin Capture. You will see the entries at the top. If you make a mistake, just press Undo. When you shoot your video, just leave the camera on. Don't turn it on and off. It's easiest to just get a tripod, aim the camera and record. Turn it off at the end of each Game. When you get home, open a Youtube account. It's FREE. Upload your videos to your own Youtube account. Make sure they are Unlisted. You can upload as many videos at once. However, this will take time so it's best to start before going to bed and let it run. Once all your videos are uploaed, launch SoloStats VIDEO and select Touch activities. Pause the video and press Sync. This will synchronize your videos to the stats. Go to Filter and select what you want to see. You will have a list of highlight actions. If you want to share the videos, select the Show Links button, copy and paste these links and email them.